The Associated Milk Producers, Inc., (AMPI) plant in Paynesville recently added two filters and increased their daily output by nearly 20 percent. The addition of two filtration systems, which became operational last week, have made it possible to process an additional 300,000 pounds of milk per day. The AMPI plant used to be able to handle 1.6 million pounds of milk per day but now can handle 1.9 million pounds. Two new filtration systems at the AMPI plant in Paynesville can separate water from whey, a by-product of making cheese, allowing the plant to increase its milk capacity by 300,000 pounds daily. As a result of the increased production, member farmers should reap the benefits with higher permiums, said Matt Quade, AMPI Paynesville Division Manager. According to Quade, the addition of the filtration systems is one way the co-op can ensure local members the best price for their milk. "We are always trying to improve production, to give the best price possible," he said. With over 60 employees in the Paynesville plant, AMPI is one of the largest private employers locally. The plant improvement has meant the addition of two new employees at AMPI. When AMPI added a new cheese belt in 2002, it gained the ability to increase production by processing an additional 500,000 pounds of milk per day. But without a way to condense whey - a cheese by-product - the Paynesville plant couldn't operate at its full potential. 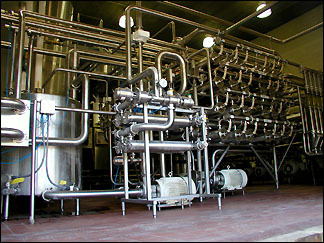 Now, with the addition of a reverse osmosis system, the plant can remove water from whey, which can be used in a number of products including bakery goods and other sweets. 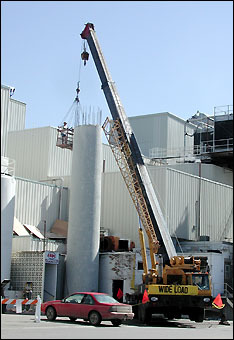 AMPI took down an old smoke stack to built two new milk silos to hold the additional milk before it is processed. Another system, an ultra filtration system, can further reduce the waste by separating water from milk protein (lactose), which also can be used in bakery goods and sweets as well as in high-protein dietary suppliments like protein shakes. Both filtration systems work similarly. Using high pressure, whey is forced through a series of membranes, which are so tight that only water molecules can pass through. The water is flushed away, and the useful whey by-products remain. The $700,000 filtration systems came from the AMPI plant in Glencoe, which was closed recently, according to Quade. The systems took about 12 weeks to assemble in Paynesville. The plant also built two new milk silos to hold additional milk until it can be processed. AMPI is a farmer-owned co-operative that operates 13 plants and markets a full line of dairy products, including milk, cheese, and butter, said Quade.